In a very laudable move to prevent deaths from opiate drug overdoses, the Department of Public Health recently began a project to get more naloxone out to the at-risk population. 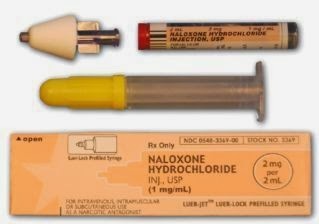 Naloxone reverses the effects of opiates and is an important tool to save the lives of drug users. "The Substance Use Research Unit received funding from the California Healthcare Foundation to conduct 'academic detailing' of community primary care providers in San Francisco to encourage co-prescribing naloxone to patients who use opioids. "Part of a larger effort by DPH to address opioid overdose in San Francisco, this project dovetails with successful naloxone prescribing efforts within the CHN. "Phillip Coffin and Emily Behar lead the pilot, which has led to production of user-friendly, visually-stimulating materials for patients and providers, and are reaching out directly, in one-on-one meetings, to 40 community providers." If you or someone you know injects or uses street drugs or prescribes painkillers, please make sure they are aware of naloxone and have access to it.